Sunllipe LED 3-light floor lamp has a sturdy structure as well as a good appearance to fit bedroom, living room, kids' room and study.Using SMD2835 LED chips,it brings a note of traditional style to decorate your living rooms. Measures 59.25 inches tall,Metal construction and shade with UFO donut style and weighted base.Good for corner lighting in a small or medium sized room. Sunllipe led floor lamp uses high brightness SMD2835 Top LED,no need to change the lights. The lifespan of this led floor lamp is about 40000 hours, which means it can last for about 10 years if you use it for 8 hours a day. 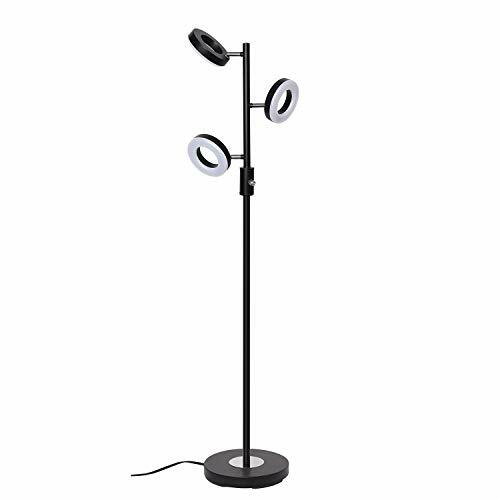 Sunllipe floor lamp provides comfortable light for reading, working, or relaxing. Its high quality, low power-consumption LEDs and light diffuser ensure effective lighting that is purer and more natural. The lamp can be turned on/off with a rotary switch. GREAT LAMP FOR READING OR RELAXING: The Tree LED Floor lamp is perfect to illuminate your reading,writing,studying and arts & crafts brightly and efficiently. Its adjustability and 3 level brightness features also allow you to position the light perfectly to illuminate where you want. If you have any questions about this product by sunllipe, contact us by completing and submitting the form below. If you are looking for a specif part number, please include it with your message.